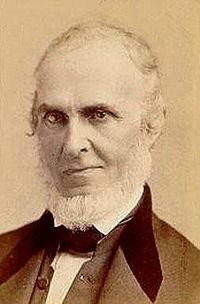 John Greenleaf Whittier (1807 - 1892) was one of the "Fireside Poets," called such because their work was popular enough to be read (ostensibly by the fire) in homes all over America. And Whittier was one of those rare poets who actually made a rather comfortable living from the proceeds of his work. Born into a Massachusetts farm family, Whittier was introduced to poetry by one of his school teachers. An avid reader and writer early on, Whittier spent much of his working life as an editor, though he had political aspirations as well. He was a staunch abolitionist, and produced two collections of anti-slavery poems, along with an anti-slavery pamphlet that managed to incur the wrath of bothsides and effectively any hopes Whittier had of a political career. Critical opinion on the value of Whittier's poetry is mixed. Some dismiss it as overly emotional, while others believe the heartfelt simplicity is precisely its appeal. "Success is failure turned inside out" is a brilliant line. The world would be a better place if everyone follows this! Nice poem with a lot of good sense! Oh, yeah. This poem reminds me of Ella Wheeler Wilcox's work--skirting the edge of sentimentality but never going over it. A pep talk I know I can use and I'm sure I'm not alone.